“Improving” my 1985 Dynasty. Here it is now. 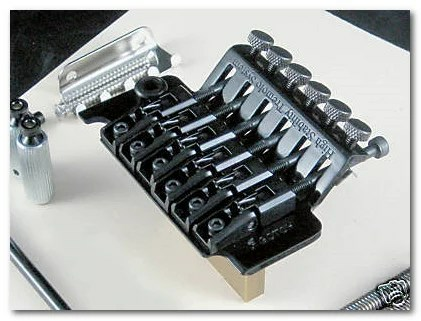 The bridge is a Gotoh 1996T. If I’ve done my homework correctly, intonation should not be a problem. What stinks is that I won’t know until it arrives I’ve also ordered a brass sustain block upgrade, it’s a much thicker block which actually makes a difference in sustain and bottom end. Oh yeah, this is better. Funny how much a new trem system changes the overall appearance. Looks great, much more “modern” for lack of a better term. The studs/posts are silver right now, scavenged from another guitar, I’ll install the black Gotoh studs/posts later. The Gotoh studs have a locking stud system which has uses larger inserts requiring larger holes, so I’ll have a guitar shop install those as I don’t have a drill press. Intonation: My main concern going into this was intonation, would this expensive Gotoh work allow enough room to intonate properly? Forum member Colt had said that intonation was an issue with the Floyd Rose, so I did my homework on this Gotoh ahead of time. After installing I only had time to intonate the low E since that would’ve been the problem area, and it worked perfect with room to spare. I was happy. I’ll intonate the other strings tomorrow and update. But so far, looks like a Gotoh will work fine on a Dynasty or Dimension IV regarding intonation. Here’s how it lines up on the body. Enough room for pull ups a whole step or more, plenty for me. 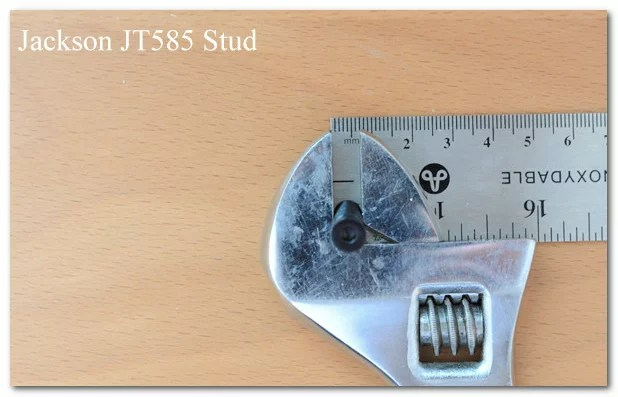 What’s odd is that the original Bendmaster has a 45mm sustain block! The longest conventional that you can buy is 42mm. Therefore, the strings hit. I’ll need to grind off the Dynasty’s cavity corner. See where the stings hit? Here it is shaved down, I used a file. No more spring rubbing! The Gotoh Floyd works GREAT, the best floyd style I’ve ever played. 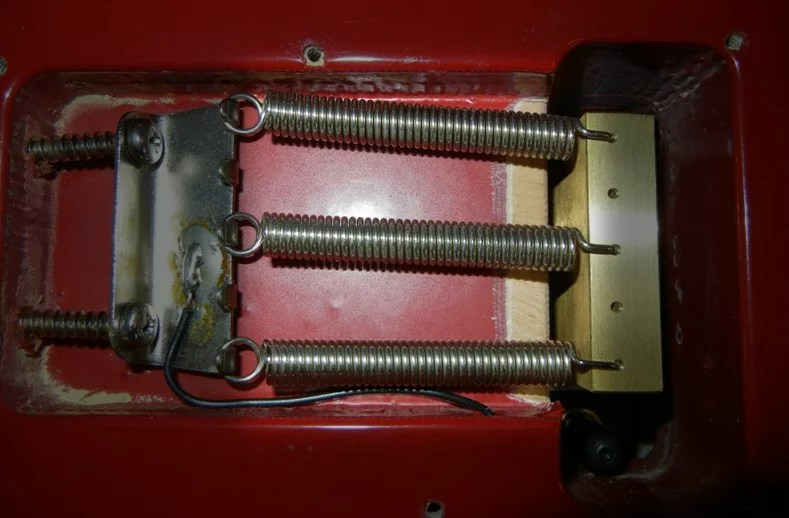 The Gotoh 1996t Floyd Rose style trem will intonate almost perfectly using the factory stud/post holes. It will be a TINY bit flat on the A string, the others strings will be dead on. Most tuners wouldn’t even show the A string intonation being a tiny hair off, but I have a super accurate strobe tuner so it shows it being a teensy bit flat at the 12th fret. 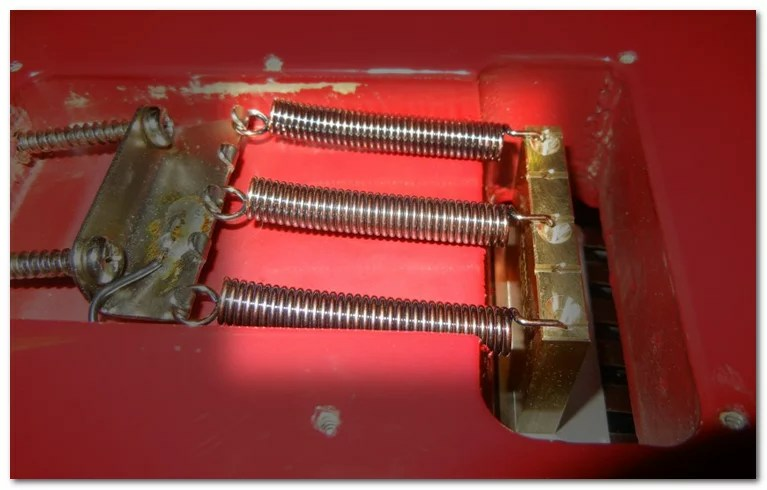 Although a different Dynasty or Dim IV may show different results as the bridge posts won’t be in exactly the same place on every guitar due to manufacturing differences. After replacing the stock bridge pins and installing new bridge studs (or “posts”, whatever you want to call them), the intonation is all better, the intonation is perfect. I bought a big brass block for the Gotoh. 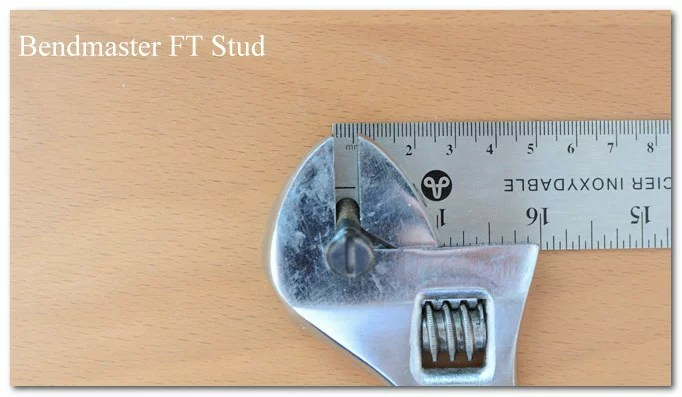 Here’s how much bigger it is over stock. A lot bigger! This actually makes an audible difference. It deepens the tone a little, maybe “fills it out” more? Hard for me to describe, but it makes a difference and it’s not just the placebo effect. I can dive till the strings are slack so no issues there at all. The Gotoh is a killer upgrade, you’ll love it Big brass block is extra but worth it. 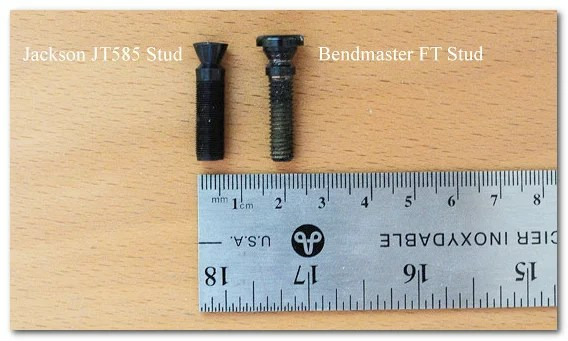 The Bendmaster studs appear to be a hair under 6mm and the Jacksons are a hair under 7mm. TheChad: I see, that is different from mine!!! 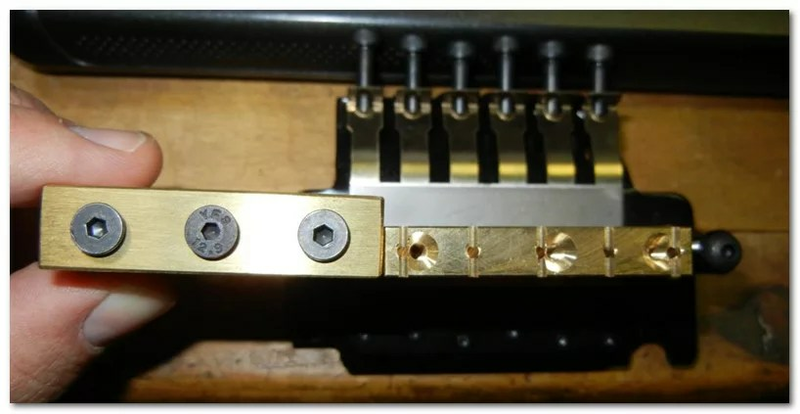 I wonder if it would be possible to shave down the diameter of the Bendmaster heads since they’re what causes the incompatibility with the Gotoh. westbone replied: Yeah just grind the ‘cap’ down.